The name of this bike is indicative of the heat-treated steel that has been clear-coated to create a unique and raw finish. Several components from front to back and bottom to top have been given the warmth of nickel electroplating. Lastly, this is the second motorcycle on which Kott has showcased this aesthetic marbleized effect. 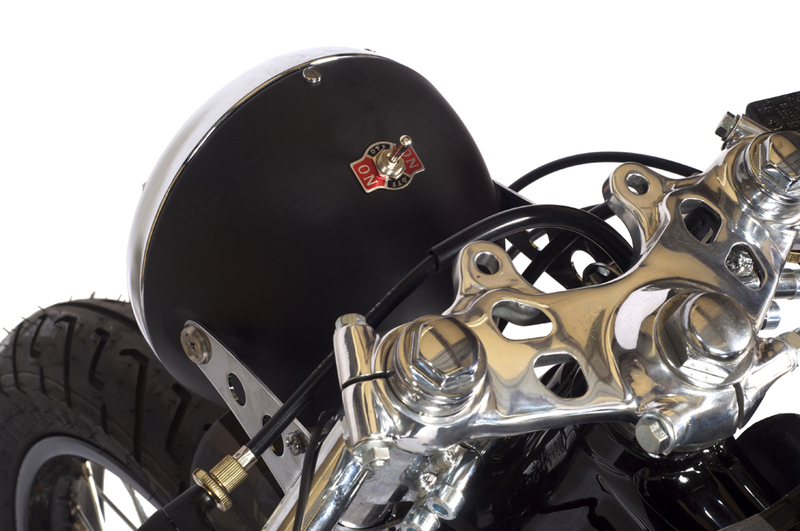 The retrofitted front drum brake, the sweeping valance header pipe stemming from the freshly rebuilt 400 F motor, the infamously sought after 400 F tank, the handmade steel seat coupled with brown leather upholstery, and the stainless wheel spokes all create a series of warm finishes that give this bike an extremely unique appeal. 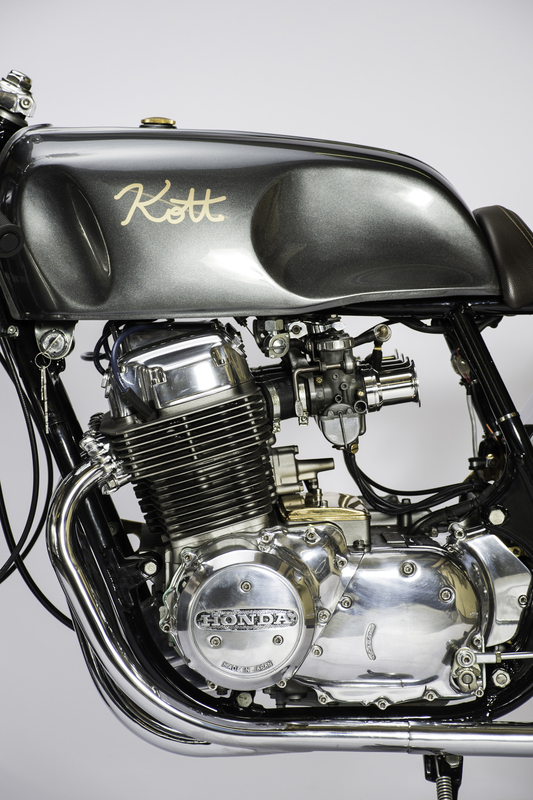 As the original Burnt Nickel currently resides in Australia, the Burnt Nickel II is destined for Vancouver, Canada--both examples of Kott Motorcycles' world-wide presence. This particular 350 came in the shop as a challenge to incorporate influences apart from the normal inspirations. The most important factors that define the stance are the upswept British handlebars, the custom flat two-seater style seat pan, and a generally revised stock look. In order to maintain an antiquated aesthetic, custom paint color was inspired by the original 1970's Honda paint code, and a well-worn walnut brown leather was used to handcraft the upholstery. The blacked-out rolling chassis brought an aggressive personality to a fairly docile small-capacity Honda twin. 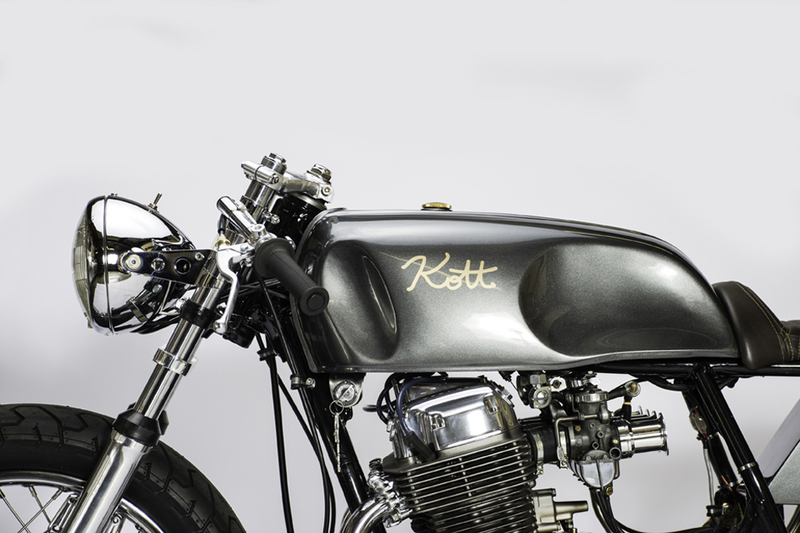 Even though the inspiration for this build was not based in the typical café form, the outcome of this build proved that we were able to take on new challenges and translate the skills of Kott Motorcycles onto a well-thought out, multi-purpose, dual rider. Definition: ve·ri·tas English ver-i-tas, -tahs] noun Latin. Truth. “Even in literature and art, no man who bothers about originality will ever be original: whereas if you simply try to tell the truth (without caring two-pence how often it has been told before) you will, nine times out of ten, become original without ever having noticed It”. This quote caught our eye because C.S. Lewis heralds from The United Kingdom—the birthplace of the café racer culture. Even though he is not referring to the eclectic café racer scene he most certainly has a point. There appears to be no doubt that the stance and approach of the café style and functionality is permeating the mainstream motorcycle movement in terms of design and philosophy. It is extremely important to match the integrity of a custom build not only with what is visible but the quality of the components that are not seen. On this particular build the motor has been completely rebuilt. The ignition system was considered and optimized with the use of brand new Dyna coils and magnetic pick-up base plate. The internals of the carburetors have been carefully selected to work not only with the four into two header pipes but also with the custom velocity stacks. Neatly arranged under the seat cowl are brand new electronic components and a one-off heat shrunk wiring harness using all OEM connectors anchored to a riveted aluminum relocation table. 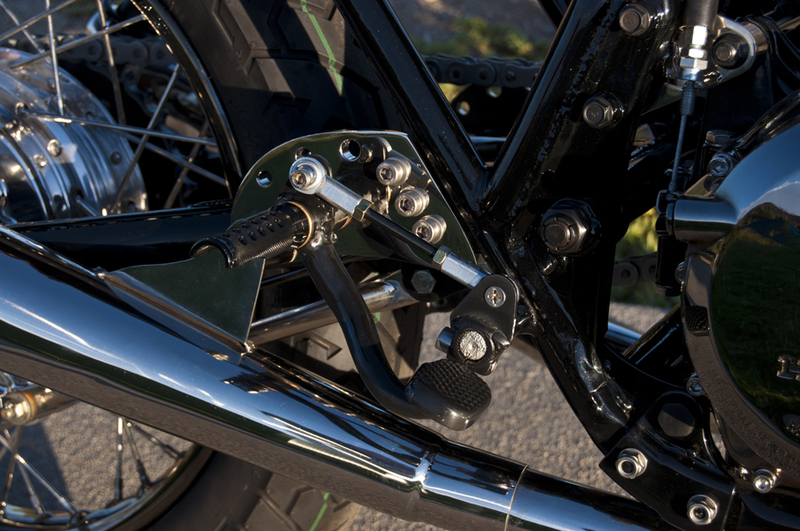 As with all builds, the rear set plates were hand-crafted and thoughtfully positioned for ergonomic efficiency working in tandem with the hand-crafted steel seat pan and cowl for optimal rider position. 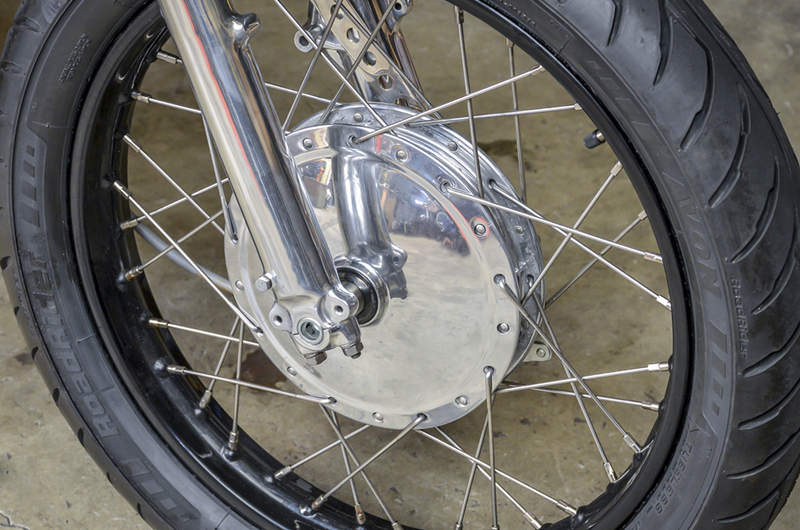 Original Suzuki re-chromed wheels were re-laced with stainless custom cut spokes. 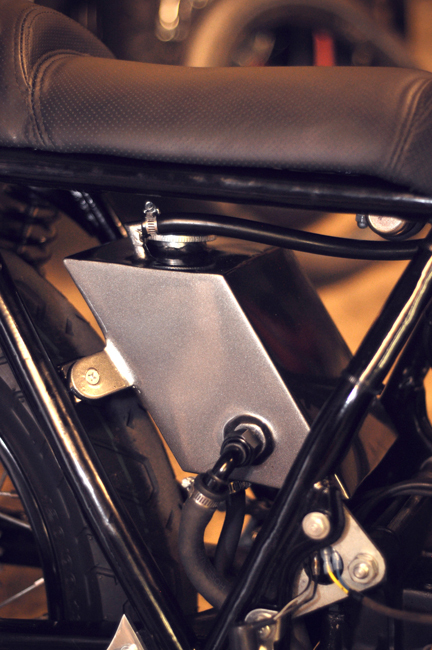 The oil tank is of a parallelogram design that replicates the 55° and 125° triangulation of the Honda frame rails. Stainless steel feed and return hose was used in unison with leak-free A.N. fittings welded into the custom steel tank. In order to achieve a refined and elegant stance, this particular build incorporated the always useful 750 Supersport fuel tank complete with hand and knee indentations. The seat was made to just the right length for a continuous flow of color against the wheel base and overall length of the machine. Indentations were added to the seat to maintain a steady and comfortable aesthetic that paired well with the BMW charcoal gray paint selection. As a visual highlight, electroplated brass was incorporated sparingly to create a warm and antique finish and complements the RK gold O-ring high-performance drive chain and 17 tooth counter sprocket. 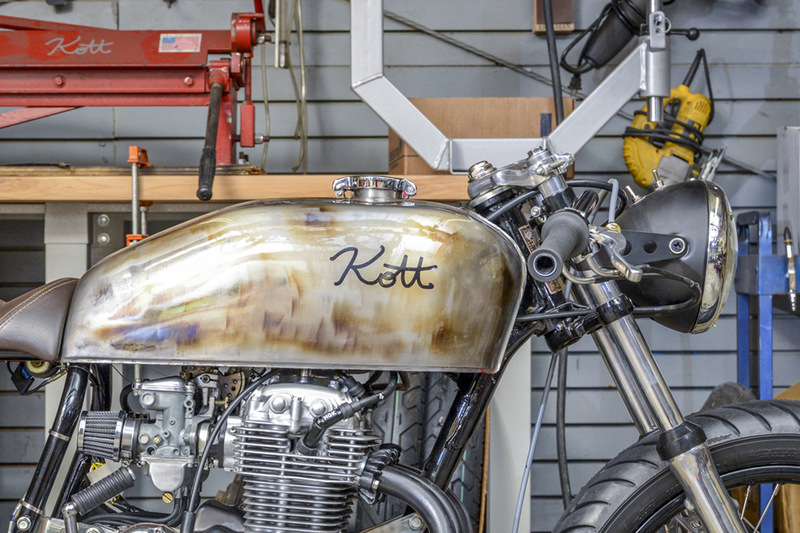 As with all builds done under the roof of Kott Motorcycles, a commitment to honest work that is well executed is a constant theme with every completed machine. Often times the inspiration for a build can revolve around one single component. 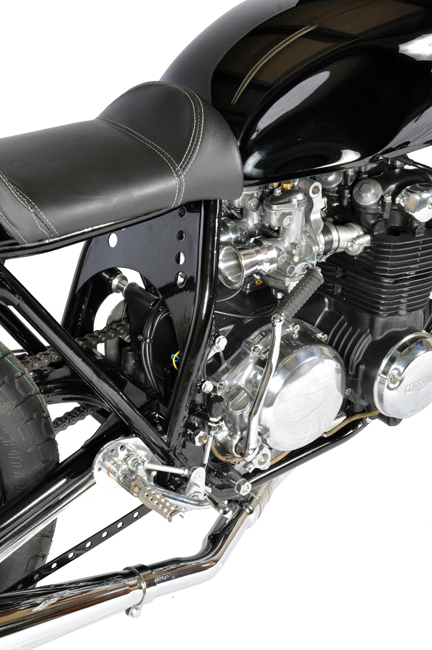 In the case of this 1976 CB 750, the rare and valuable four shoe front drum hub of the Suzuki Triple Two-Stroke Series became that very component. Scarlet is an example of a classically styled and redundantly simplified archetype of a vintage race-inspired machine. The beauty of this build is in its simplicity. During the build process it seemed at times that this bike was so void of extraneous features, almost as if something were missing. However, as the build reached fruition, it became clear that its clean, unfettered appearance was not lacking anything and another heirloom rolled out of the shop. 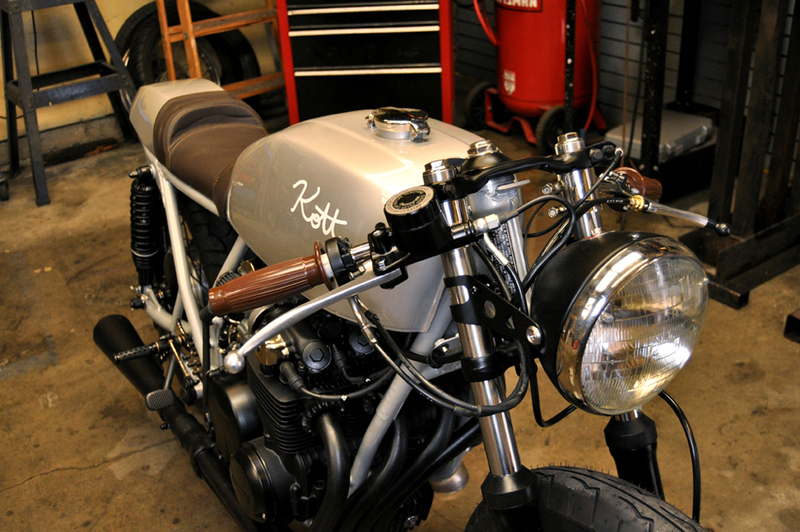 It has been a great summer of builds at Kott Motorcycles. An active approach has been taken toward seeking out builds that are a challenge to translate into truly one-of-a-kind, well-balanced café racers as well as a commitment to always improving skill sets here at the shop. When this first year 1979 DOHC entered the shop, I initially had some reservations as to how and if there was anything that could be done to balance out this machine and to create more fluid lines. An immediate curiosity arose concerning the performance and technological advancements in comparison with the infamous SOHC 750 series. In order to optimize performance, the DOHC motor was completely disassembled and rebuilt from the transmission up. The engine cases were powder-coated and unique black chrome plating was used to accentuate components throughout the engine and the chassis. Necessary modifications were made to the carburetors in order to eliminate the clunky factory air box and to facilitate a set of K&N individual pod filters. Any enthusiasts familiar with this particular bike definitely know that the frame needs heavy modification in order to appropriate better lines. The last 6 inches of the frame including the rear fender gusset were removed in order to weld in a steel battery/electrical component table. To maintain a continuous straight line along the bottom edge of the frame, a custom steel-constructed seat was built to clear the shock towers and recapture the continuity. 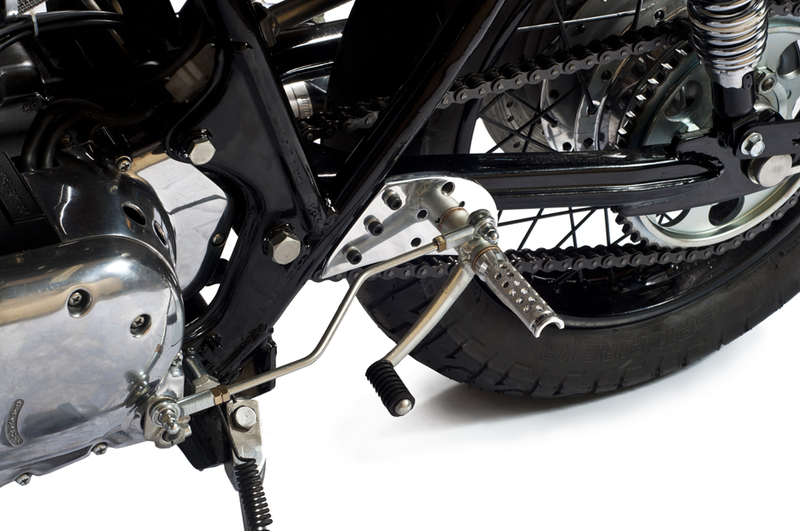 Again, in order to create a more vintage stance, a tank from a different Japanese manufacturer was used on the Honda frame to not only appropriate the tank height against the triple clamp but also to distract from the severity of the original tank angle. 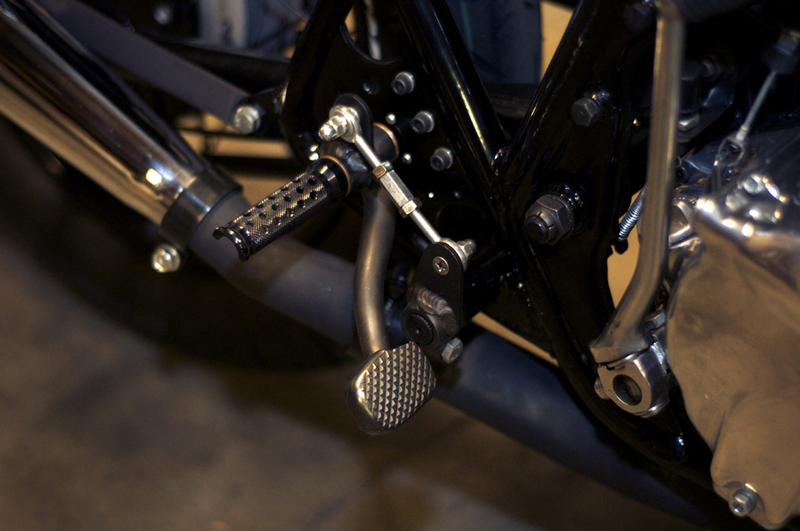 Custom Works rear-shocks were also added not just to improve handling but to raise the back-end of the bike up to a level line. Hand -cut rear-set plates were installed on the build to suit the ergonomic position of the rider. 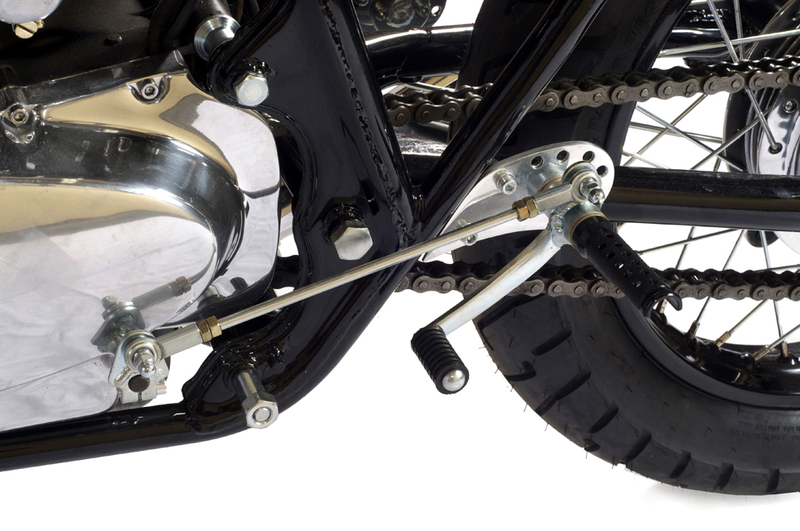 The overall design of the rear-sets incorporated re-purposed original actuation levers in order to maintain a vintage appeal. Among certain advantages, the most noteworthy is the wet sump design of the engine that allows the triangulation of the frame to remain open creating a desirable non-cumbersome aesthetic effect which is normally not achievable with a dry sump design that requires an oil tank. My favorite aspect of this particular build is not only that it looks like an engine with handlebars but I also believe that we captured the essence of marrying a vintage aesthetic with new technology thus creating a bike that has a modern day appeal. Years ago I rode a 1972 XS 650, also known as the XS2 from Los Angeles, California to Sturgis, South Dakota. I was wearing a cheap rain suit from Walmart in the pouring rain going at least 100 MPH to dodge the inclement weather. When I stopped at a gas station some locals took one look at me and said "you were going so fast that your damn clothes are tearing off! You passed us like we were standing still"! These are my memories of the infamous XS 650 made famous by the legendary Kenny Roberts. I decided to take on this project when it rolled into the shop because at the time when I owned my XS I simply did not possess the skills and knowledge to re-purpose it into a more sleek and refined machine. As a shop we have come to be known for our renditions of the Honda CB series so taking on a Yamaha was a testament to actively breaking paradigms of what is expected. The 650 has the reputation of being the 'best Triumph that Triumph never made'. This being said, the Japanese mimicked the overall stance, footpeg position, tank design, and general engine shape. Without a closer look, the two are easily mistaken for one another. In paying homage to the parallel twin look that is so synonymous with English motorcycles, the great Norton Commando was the main influence in the design of this machine. 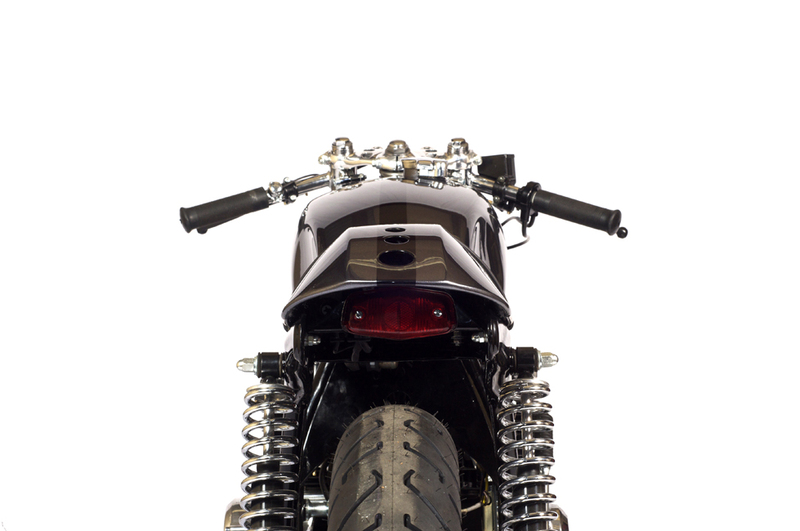 In order to create a more aggressive stance and fluidity of frame lines a Yamaha XS 750 triple tank was fitted to the frame with some necessary tank mount alterations. 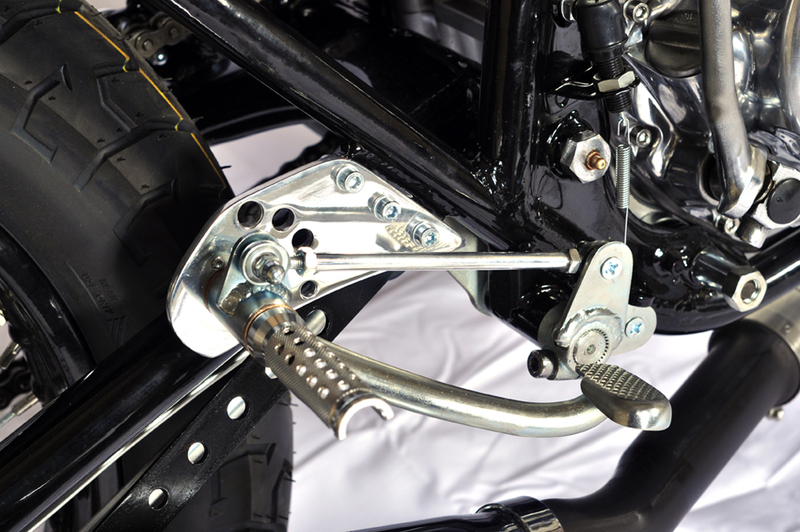 With the factory indentations and the positioning of the hand crafted rearset plates, rider position was improved. The steel constructed seat pan and cowl copied and repeated the indentations of the tank for the sake of continuity, and created an ideal "pocket" so as to not have the rider slide off the seat under the torque of the 650 twin. 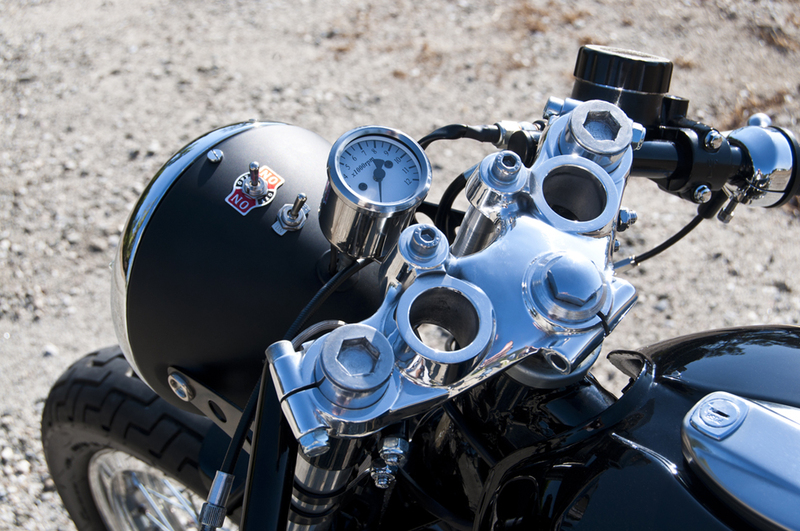 In maintaining the inspiration of the English twin, extensions were added to the single header pipes for each cylinder and kicked up at a more aggressive angle per retro race machines of the era. Handling was considered with the fitment of shouldered and re-laced aluminum wheels, Hagon rear shocks, new fork springs and replaced swingarm bushings. An extra drilled rotor and caliper was added to the front end in order to optimize braking power and to assist the older technology of the rear drum brake. Under close scrutiny, those who are familiar with the XS 650 frame will see numerous modifications made to accommodate rearset positioning and beautification. As mentioned beforehand, the Norton Commando was emulated in many ways in order to a create a more well balanced and repurposed machine. The most noteworthy influence was in the jet black paint scheme that incorporated a hand-striped gold line to accentuate the shapes and shadows present on the bike. 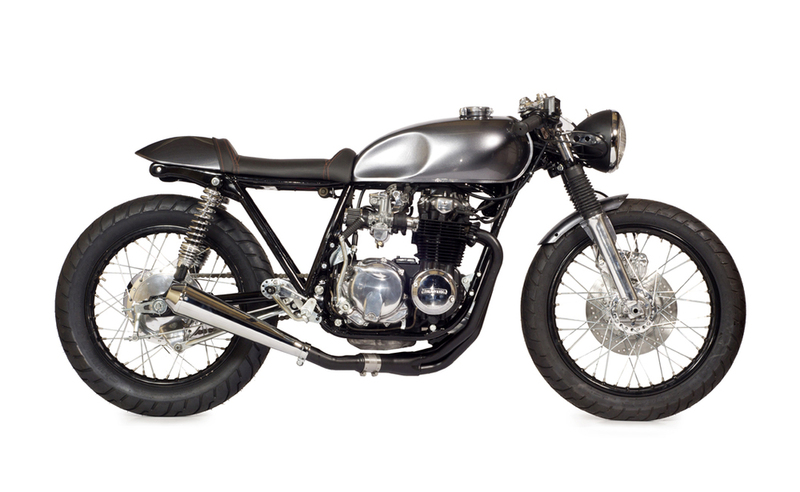 The donor bike, a 1969 CB 350, has a rebuilt stock displacement motor that at its core runs as well as a CB 350 is known to. The fuel tank that was fitted from a Suzuki from the late '70's of a much larger capacity. 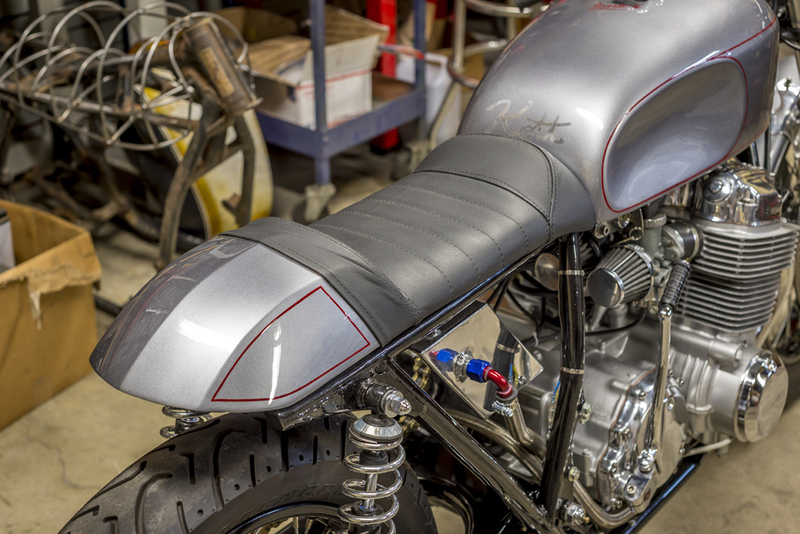 The seat was constructed in the signature Kott design using round bar and sheet steel with a concept in mind to match the oversized tank with the in congruently small tail section as a throwback to the famed T.T. Manx racers. 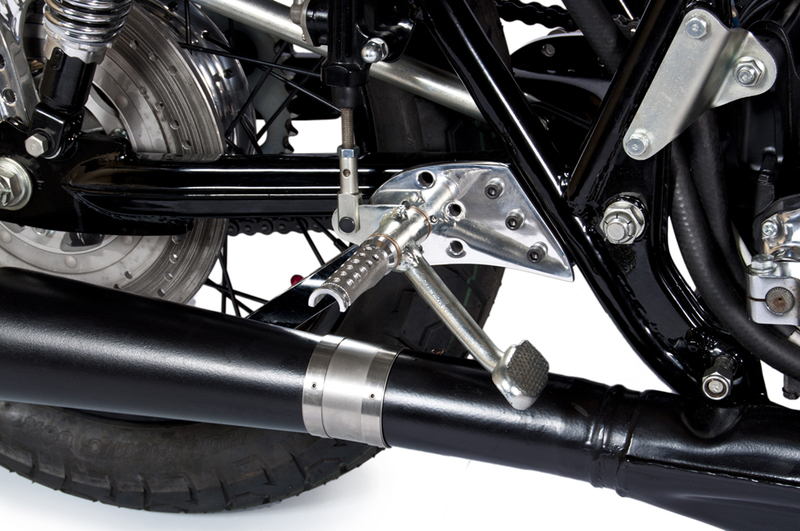 An extension was made for each individual exhaust pipe to create a more angular and aggressive exhaust stance. 4 1/2" Italian made CEV headlight was used in order to appropriate the smaller stature of the machine and to facilitate a downsized speedometer that runs off the original speedo cable all housed in a handmade headlight fairing that carried an aesthetic appropriation of color and fullness to the front of the machine. The powder-coated black wheels were fitted with stainless spokes and highly polished hubs, bringing new life to the rolling chassis. 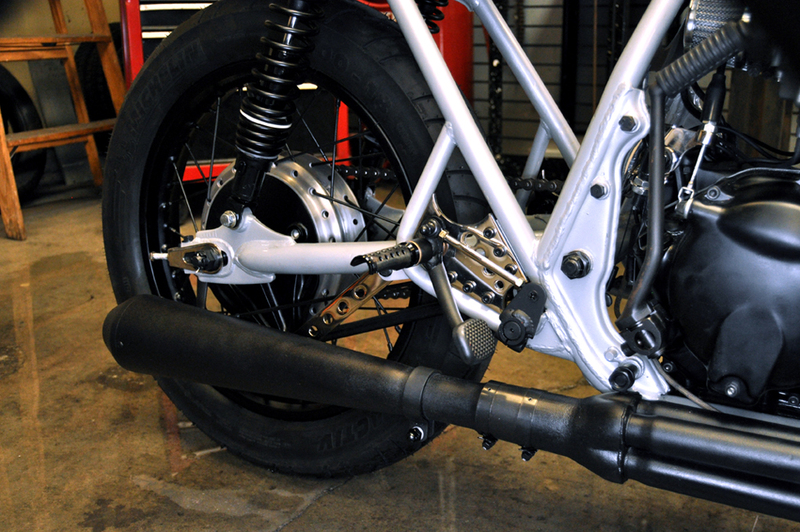 Heavy frame modifications, hand-cut rearsets, and a dedication to a well-balanced, great performing machine has provided a glimpse of an exciting new series of 2013 builds currently underway. It is always a challenge to have a blue finish on any machine that does not lend itself to a purple hue. This bike has been aptly nicknamed the 'ink blue 350' for its deep blue nearly black color. 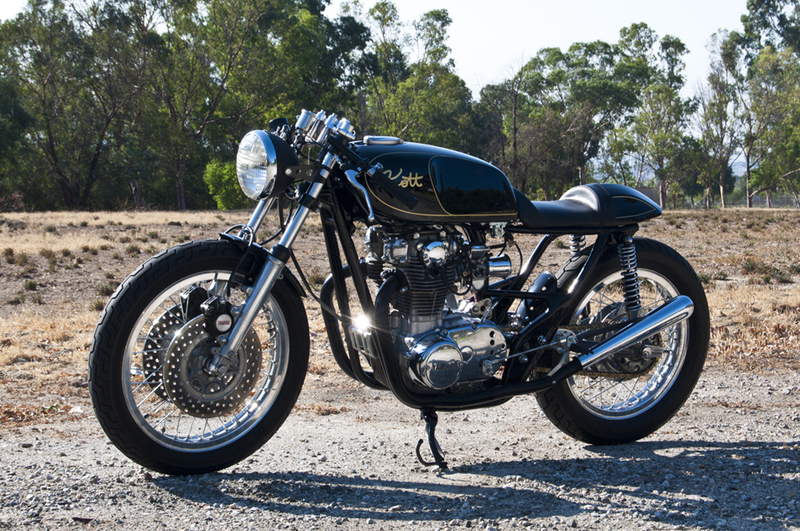 In its short life, this bike has been featured in several magazines and was awarded 1st place at the AHRMA sponsored annual event Corsa Moto Classica in Willow Springs, CA in April 2013. It has also been selected to be featured at the annual Sturgis motorcycle rally in the exclusive Ton Up exhibit in August 2013. When a design concept starts out as being somewhat unclear, I have incorporated a philosophy as a default to mimic or recreate something I feel manufacturers may have done in the ‘70’s. This is the second Supersport built recently with an FZR 600 rear master cylinder. The tank still has the stock paint job and the seat was built to match the aesthetic of the tank including an incorporated decal maintaining the continuity of the lines on the tank. As a unique addition to the upholstery, the seat pan section of the leather contains the cattle brand. Appropriately called The Marlboro 750, this bike is center stage during the fabrication process of the late 2012 commercial filmed in the shop by Marlboro. 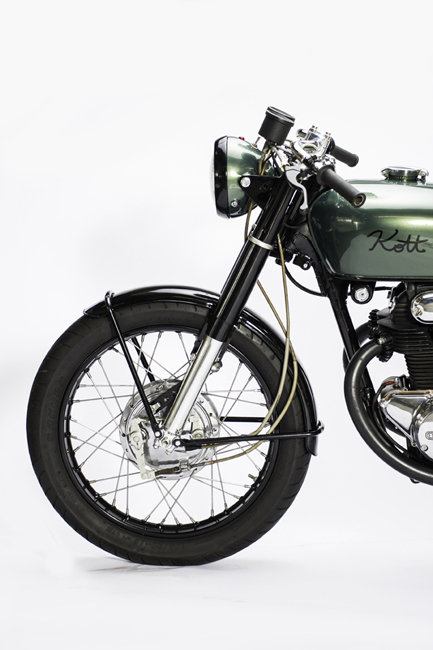 Due for release in European countries in 2013, one can observe the transformation process of a forgotten, neglected machine into a finished Kott motorcycle. 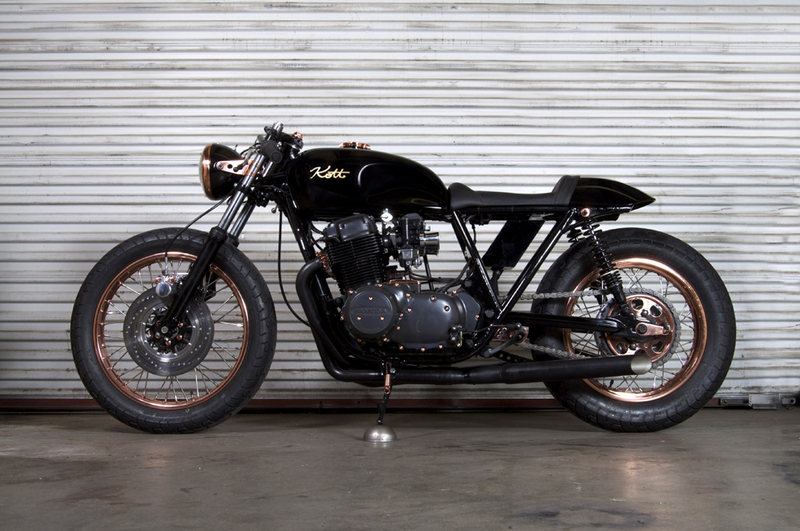 This bike is not breaking any new ground aesthetically as we have previously done a number of machines with a similar finish, but this is the most accurate and relevant depiction of a 2013 build. The Marlboro 750 will ultimately reside in Ontario, Canada and lends itself to the testament of international acclaim of Kott Motorcycles. Nicknamed the "Saint and Sinner" by its owner, this bike entered the shop as clunky and cumbersome as all 750 Supersports do. With a desperate need for weight reduction, lowered center of gravity, and machine manageability the motto for a Honda 750 Supersport is "keep it stock or chop hard". Complete renovation of the rear disc brake was the first task at hand. 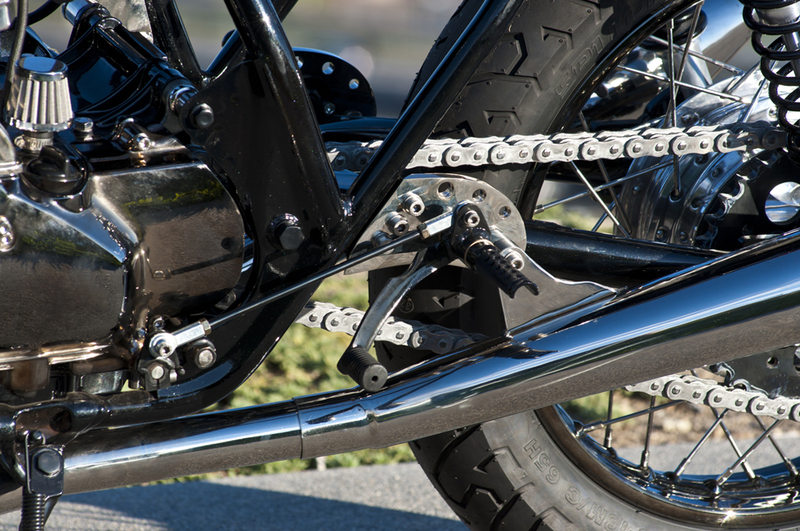 The incorporation of a modernized rear master cylinder as well as a rear set design that not only maintains a period-correct aesthetic and at the same time capitalizes on present-day functionality, has made this bike an exceptional, enigmatic creation. This late 1970's Supersport 550, aptly named for obvious reasons, included a first-of-its-kind front headlight fairing--a build feature carried into 2013. Notably the overall size and shape of the Supersport fuel tank demands an angularity in the rest of the steel body components. The seat introduced relatively harsh angular lines that fish-mouthed a tightly hidden taillight. 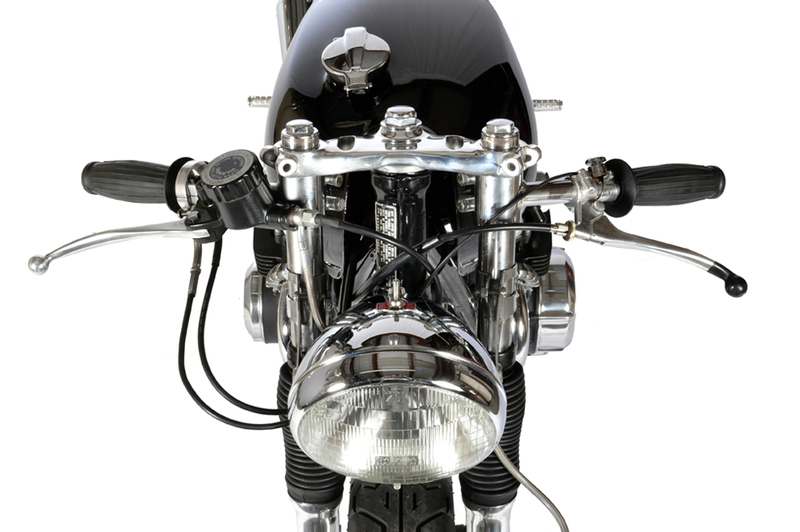 The front headlight fairing constructed in the same way as the seat (1/4" steel round bar and sheet steel) also introduced an aesthetic heaviness and height to the machine that filled the obvious void between the prominence of the late-'70's fuel tank and the face of the headlamp. From the rider's position on this bike, one really feels the sense of being connected to the machine. Black oxide and black anodize were used heavily as a finish on this particular bike--something new to the designs of late 2012. This is one bike in a series of charcoal gray themed bikes that were built nearly back to back with each other. The differentiating finish on this particular 1975 CB 550 is the contrasting brown leather seat carried into the brown grips that gives this bike an antiquated, warm feel. Two late model 550's were built in sequence with each other and contrary to past belief, the late models ('77 and '78) have some distinct advantages over the earlier K-series machines. Through weight reduction and improved seating position, this machine, even with its press-fit pilot jets slightly drilled, and hardly a step up on the main jet, the late model carburetors on this bike offered tremendous performance advantages with only slight modifications. This bike was the second built in a short run of the 2012 black series. The second late model ('77) 550 built. The finish was simple--monochromatic silver, brown leather and grips, and black finishes including the spokes are all highlights of this bike. The curiosity of running a 400F Supersport tank on a 550 frame sets this bike apart as a unique variation of what can be done with the Honda CB series. The bike hearkens its name from the hometown where it now resides. This also being part of the charcoal series was given distinguishing marks to set it apart from the others. 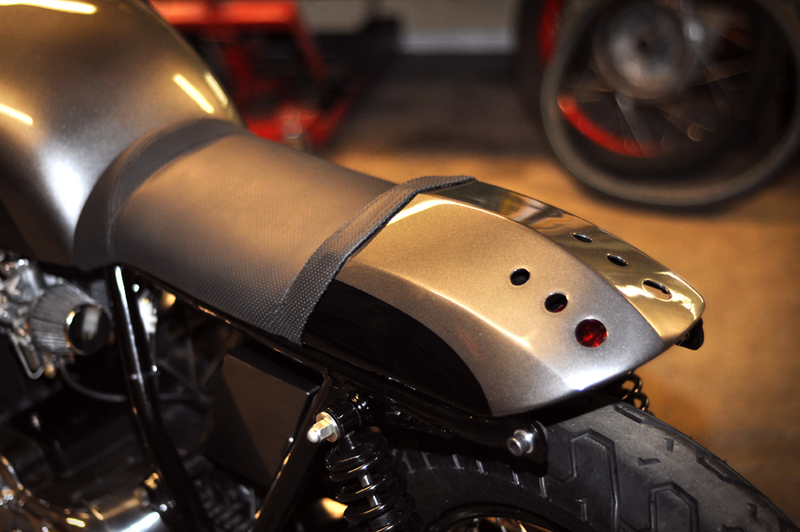 A couple of these marks include an inline black center stripe from the custom front fender "new in 2012" into the fuel tank and an a uniquely designed custom seat. The uniqueness of the seat design incorporated 3 centered lightening holes to reveal ambient tail-lighting as well as orange stitching on the seat upholstery which introduced a trifecta of color. This bike can be seen featured on the new 2013 Kott Motorcycles t-shirt design. The first of the black series, appropriately named the Fonz, with implementations of classic and timeless styling. 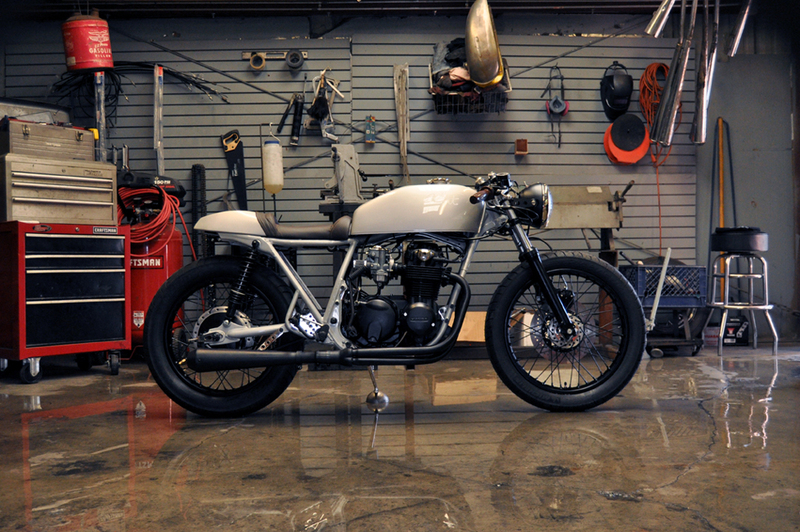 This 1972 CB 500 is a benchmark of simplicity and ever-enduring cool. This particular 1973 500 has and will continue to hold high regard as one of the better machines that left Kott Motorcycles in early 2012 and then went on to set the standard for subsequent machines built in the months to follow. This 500, featured in Return of the Cafe Racer as well as in the very first issue of Iron and Air, boasts a flat silver monochromatic finish, a chestnut brown leather seat, and numerous handcrafted components rich with antiquated brass plating. This build was a turning point for both improved aesthetic and mechanical design due to increased innovative ideas as well as a higher price tag which allowed for the then-unprecedented outcome of the finished build. It is said that necessity is the mother of all invention and this particular bike is no exception. At the time of its construction, there were simply no 500/550 K series fuel tanks available The 500 Twin tank, however, that is currently on this build had sat in the rafters for some time. With slight convincing and moderate frame massaging, this 550 was given a look like none other. 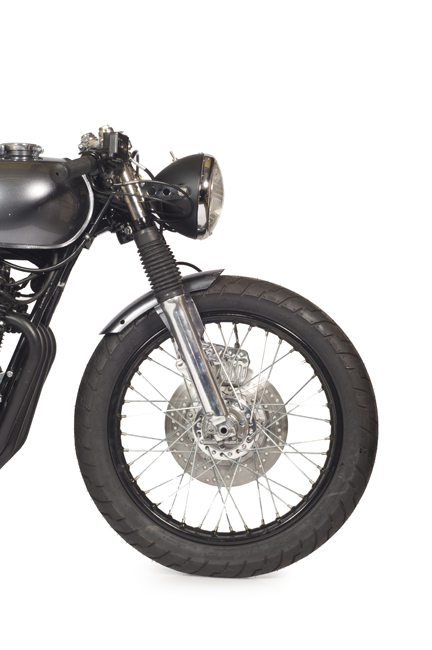 The classic silver, black, and chrome finishes make this build one of a kind and it might one day be found traveling the countrysides of England. This bike has earned its name from its close replication of "The Original"--my own personal bike. The client referenced "Cafe Cowboy", a short film that was created to showcase my shop and also featured riding segments of myself on "The Original". One of my shop rules is that no bike be exactly replicated so as not to limit creative capabilities. However, being that the client was adamant about his build preferences, I actually embraced building a refined, polished and more well-behaved version of the bike that I have come to love and trust implicitly.